Earlier this month EPA announced a tool that allowed users to print fuel economy labels for their used vehicles. This is perfect for the person looking to park their near-mint Cobalt in the Wal-Mart parking lot and want to showcase the car’s fuel economy. 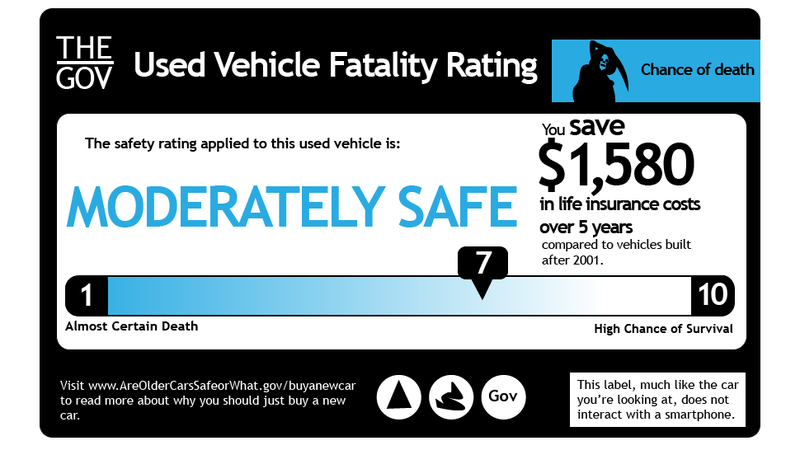 What if a similar approach was applied to vehicle safety, but instead of displaying the car's safety rating from the year in which it was built the label would reflect a new safety measure based on current technologies (i.e. how safe is a ten year old vehicle vs. a five year old vehicle vs. a brand new vehicle)? In a way, that’s sort of what NHTSA hinted at in a recent report titled, “How Vehicle Age and Model Year Relate to Driver Injury Severity in Fatal Crashes.” In this report the agency looked at “the injury outcome of drivers of passenger vehicles from MY 1985 to 2012” involved in accidents from 2005-2011. The agency’s conclusion; older cars are less safe (duh). The purpose of the report was to highlight achievements made in vehicle safety technology and their impact on reducing overall roadway fatalities. While the conclusion isn’t shocking, it did lead me to dream up this notion: What if we could apply a retroactive quasi-safety rating to a used vehicle in the form of a label? So, I made a label. Now before you go all anti-government on me, let me state this: there is NO evidence to indicate the government (or anyone else) is even remotely considering this as an option. A) Read the report. It is interesting. B) Always wear your seat belt. C) Comment on the stupidity that is the label I invented.